On a year marked by a strong Republican wave nationwide, the State of California elected Democrats to the state's top offices of Governor, Lieutenant Governor, State Controller, State Treasurer, Superintendent of Public Education, Insurance Commissioner and United States Senator. On November 24, 2010, the California Democratic Party set a record for winning every statewide elected office in California in a single election when the last outstanding race - the one for Attorney General - was decided in Kamala Harris' favor. Because fellow Democrat Dianne Feinstein holds the other Senate seat that was not up for election in 2010, the Democrats held every statewide elected office in California beginning in 2011. There are 40 seats in the State Senate, the upper house of California's bicameral State Legislature. Voters in the 20 even-numbered districts of the California State Senate will vote for their representatives. Voters in all 80 of California's State Assembly districts voted for their representatives. This is a legislatively referred state statute that would authorize an $11.1 billion bond to upgrade California's water system. 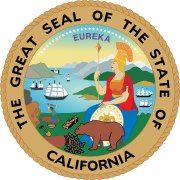 On August 9, 2010, the California Legislature postponed the vote on the proposition until 2012. This is a citizen-initiated state statute that would suspend California's Global Warming Solutions Act until statewide unemployment falls below 5.5% for four consecutive quarters. ^ "November 2, 2010, General Election". California Secretary of State's office. Archived from the original on August 10, 2014. Retrieved December 13, 2010. ^ "Qualified Statewide Ballot Measures". California Attorney General's office. Archived from the original on 2014-05-16. Retrieved 2010-06-25. ^ "Another Schwarzenegger Idea Runs Dry". Reason. Retrieved 2010-08-10. This page was last edited on 11 April 2019, at 10:51 (UTC).